When a small group of Roman soldiers made their way quietly to the walls of Syracuse in 212 BCE, they were looking to end an almost two-year-long siege that had left the Roman army frustrated and desperate. It was the festival of Artemis, goddess of the hunt and nature, and though it was being celebrated by the Greeks within the city walls, the darkness of the night seemed to favor the exhausted Romans. The Syracusans had become over-confident, but they had reasons for believing in their success. Every time the Romans had tried to breach their walls, the inhabitants had beaten them back. Archimedes directing the defenses of Syracuse. For the Roman general and Proconsul, Marcus Claudius Marcellus, it had been a disaster. Too many ships had been sunk, too many soldiers lost. His decision to siege the city had taken its toll. Now, victory or defeat lay in the hands of his best men. Marcellus knew the source of his problems and why the city seemed impregnable. A local engineer had joined in the city’s defense, but this was no ordinary man of mechanics and math. It was Archimedes who had been orchestrating Syracuse’s staunch resistance, and it was his brilliance that had stopped the Romans dead in their tracks. This man’s mind was their true enemy. Science was the weapon being wielded against them. An entire army of professional soldiers was losing to the genius of one man. 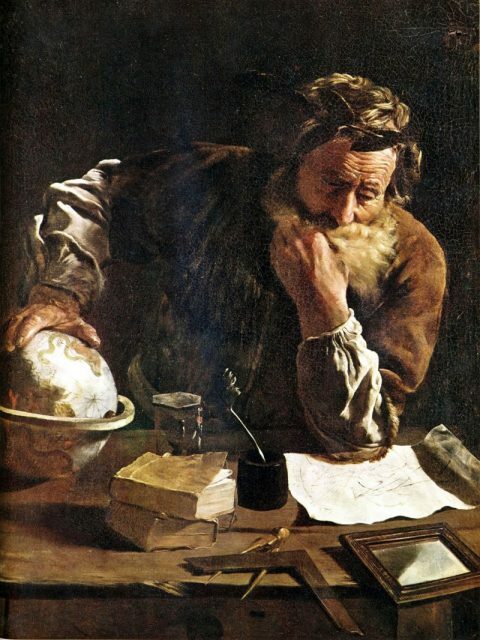 To this day, Archimedes is considered the greatest scientist and engineer of ancient Greece. Known for his inventions and knowledge of mathematics, he was a man whose mind reached far beyond his time. He left a profound legacy in a wide variety of scientific fields, calling his approach to such complex studies the “mechanical” method. A philosophy centered on understanding the world through math, physics, engineering, and astronomy permeated all of his work. Though we know more about Archimedes than any other scientist of his time, much of what is known comes to us through anecdotal stories and tales. To later historians and scientists, he remained a larger-than-life figure, a paragon of mathematical precision and understanding. The legends surrounding his defense of Syracuse reflect the immense respect and reverence the world has had for him throughout history. 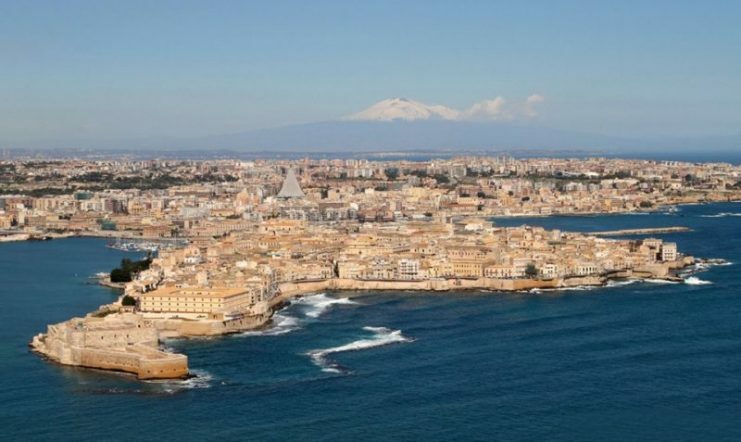 Syracuse was a city-state on the east coast of Sicily, founded in 734 BCE by Corinthian and Tenean Greeks. Becoming one of the most powerful states by the time of the Classical Greece period, it had already played major roles in the wars between super-powers of the time. 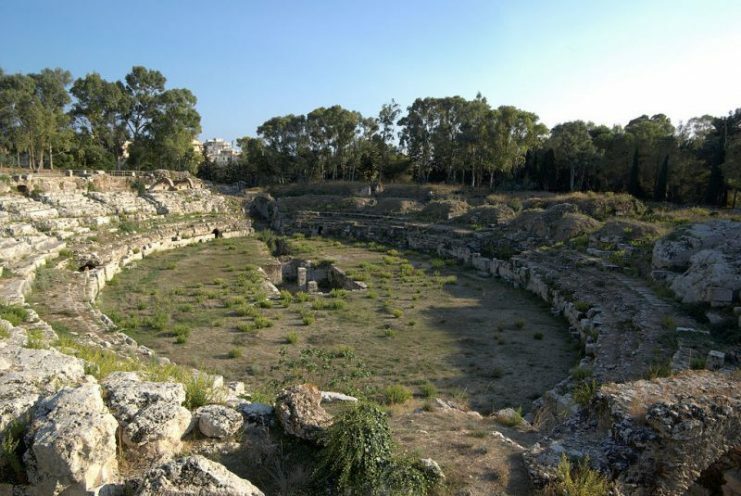 Its strategic location within the Ionic Sea and an alliance with Sparta was enough for Athens to invade Sicily, attacking Syracuse in 431 BCE during the height of the Peloponnesian War. The Athenians would never recover from the catastrophe that followed. 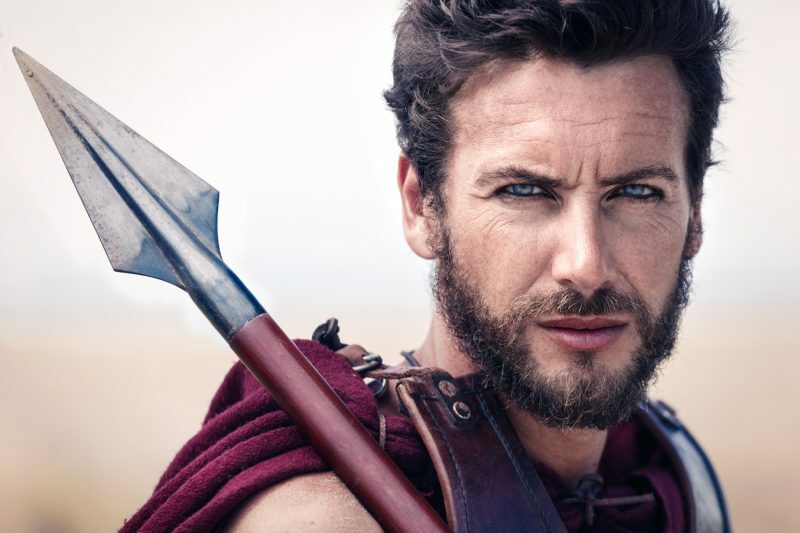 Their loss in Sicily would mark a massive turning point that would eventually lead to Sparta’s victory in the war. Despite its contentious position, Syracuse remained a beacon of art, science, and commerce. It reached a level of cultural achievement that rivaled Athens itself. By Archimedes’s time, the Syracusans had continued to live up to this reputation. But changing times would once again pull them into the ambitions of two great powers. Rome and Carthage had already concluded the First Punic War in 241 BCE, a war that had left the victorious Romans in control of Sicily. Though the island became a province of the Roman Republic, Syracuse retained their independence and influence within the Mediterranean world. The city-state enjoyed a period of peace with Rome under the reign of King Heiro II. His assistance during the war had cemented an alliance with the growing Italian power. Archimedes held a close relationship with the king of Syracuse, frequently being employed by him to solve complex and difficult problems around the city. His abilities were not lost on the ruler. From inventing a water pump to remove rainwater from ships to testing the amount of gold in the king’s crown, Archimedes’s genius made him the most famous and well-respected scientist of his time. In his youth, Archimedes studied in the cultural and scientific center of the Greek world: the prestigious city of Alexandria. Following in the footsteps of famous mathematicians such as Euclid and Eratosthenes, his immense knowledge of geometry and physics was no doubt a product of his tutelage under the brilliant successors of Alexandrian science and discovery. When he returned home to Syracuse to solve the practical problems of Heiro II, he was more than prepared to apply his skills in the service of his king. But according to the Roman historian Plutarch, he viewed this application of his abilities as boring and a waste of time. His pride and passion were in pushing the limits of maths and physics to achieve a better understanding of the world around him. Focusing on the trivial tasks presented to him by the king were an interruption to his true work. Nonetheless, when Heiro II asked him to construct mechanical devices for the defense of his city, Archimedes obliged. 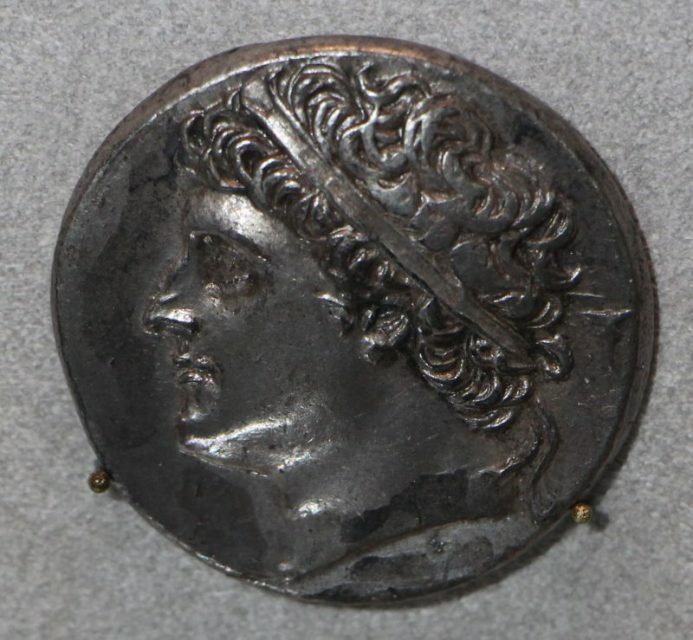 After the death of Heiro II in 215 BCE, a pro-Carthaginian movement within Syracuse began to grow under the rule of his grandson, Hieronymus. Though he and the leaders behind this political shift were soon assassinated, an alliance was made with Carthage under the new republican government that came to power. This radical change in disposition was enough for Rome to see the city-state as a growing threat to their dominating presence in Sicily. In 214 BCE, the two states declared war. The famous Claw of Archimedes as imagined by the Renaissance artist Giulio Parigi. Although Rome was busy fighting the Carthaginians in the Second Punic War, they still found the time and opportunity to attack Syracuse. Marcus Claudius Marcellus laid siege to the city by land and sea in 213 BCE. Faced with the difficult task of overcoming the well-built fortifications of Syracuse, Marcellus and his army were repulsed in every assault. With Archimedes behind the walls, the soldiers and citizens within had become willing tools to operate his instruments. 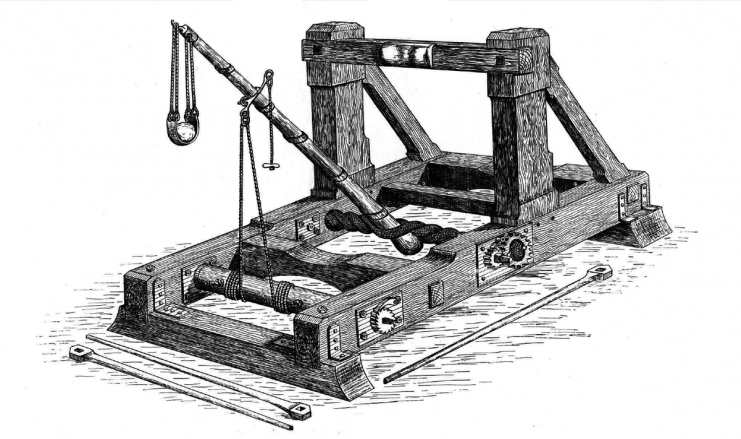 Well-versed in the importance of engineering in siege warfare, the Romans brought their own contraptions. Ships carrying ladders and grappling hooks sailed toward the city with the intention of scaling its walls. But the quick mind of Archimedes was already formulating plans to counter the might of Rome. 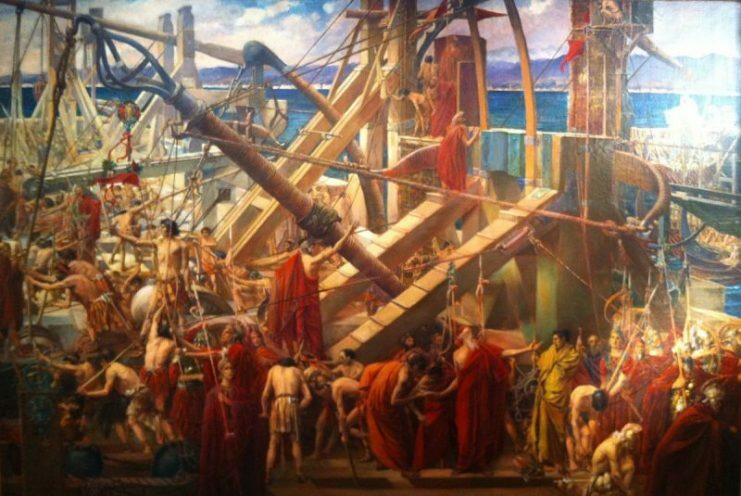 Though most of what we know about the battle is through the words of later Roman historians like Polybius, Livy, and Plutarch, it is clear that Archimedes’s involvement in the Siege of Syracuse left an impact important enough to be remembered in an almost mythical fashion. Coin of Marcus Claudius Marcellus. One of his inventions was said to be a large wall of mirrors that could set the Roman ships on fire by reflecting light from the sun. 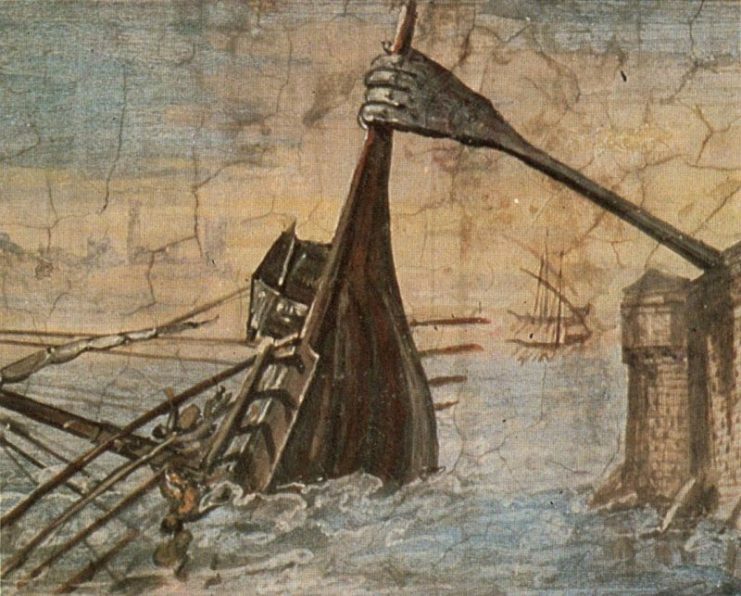 A more probable construction was the Claw of Archimedes, described as a massive crane with a grappling hook that extended into the sea. According to Plutarch, this device could lift a ship out of the water and drop it back down with devastating effect — flipping, crushing or capsizing the vessel. Besides the novel instruments Archimedes is believed to have built, much of his tenacious defense of the city came from the more traditional use of physics in war. Siege equipment and artillery were his primary weapons in the fight against Rome. He utilized onagers and ballistae with an almost impossible precision at incredibly long distances. Even when Roman soldiers reached the walls of Syracuse, they would be met by a hail of mechanical fire from smaller machines. Marcellus could not afford any more direct attacks after suffering such heavy losses. He was forced to keep his army outside the city walls to wait for an advantage. But the Romans could not maintain their blockade at sea well enough to prevent a flow of supplies from slipping through to Syracuse. What began as a siege had become a stalemate. The Roman soldiers that climbed up the walls of Syracuse in 212 BCE must have anxiously anticipated some strange trap set by Archimedes to annihilate them. But the festival of Artemis proved to be a valuable distraction, providing the Romans with the time they needed to open the gates and allow the army of Marcellus to storm the city. Having a great respect for his legendary foe, Marcellus ordered his troops to find Archimedes and bring him back unharmed. Unaware of his city’s fate, the scientist remained fixated on geometric designs he had drawn into the dust. 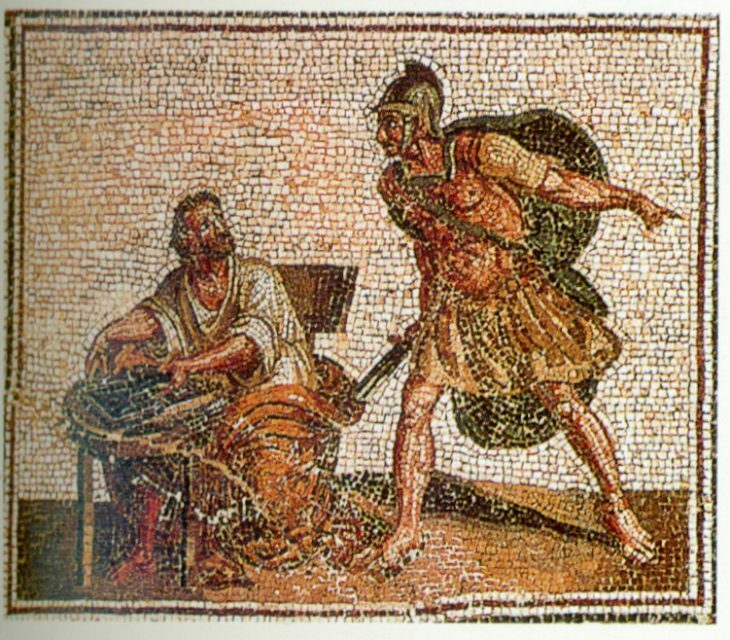 A mosaic depicting Archimedes’s confrontation with a Roman soldier. 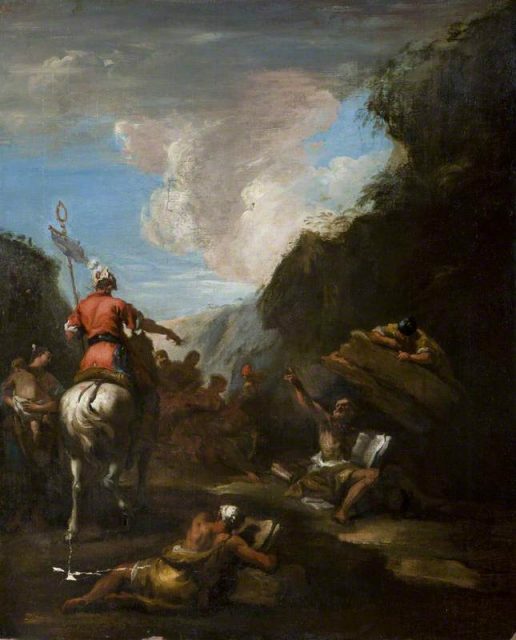 Enthralled by his desire for his discovery, he ignored a group of Roman soldiers when they ordered him to follow them back to Marcellus. He was intent on finishing his work and insisted that he be allowed to complete it before leaving. While the reasons vary as to why he was killed, in all accounts he was slain on the spot. According to the Roman writer Valerius Maximus, “Noli obsecro, istum disturbare,” or “Do not, I entreat you, disturb that,” were his last words, referencing the work he had laid out in the sand. Whether this is true or not, the phrase is a testament to Archimedes’s devotion to science and its mysteries. Archimedes would remain a source of inspiration for genius minds of later times. Men of similar caliber and intellect like Galileo Galilei and Leonardo da Vinci would consider themselves disciples of his work. 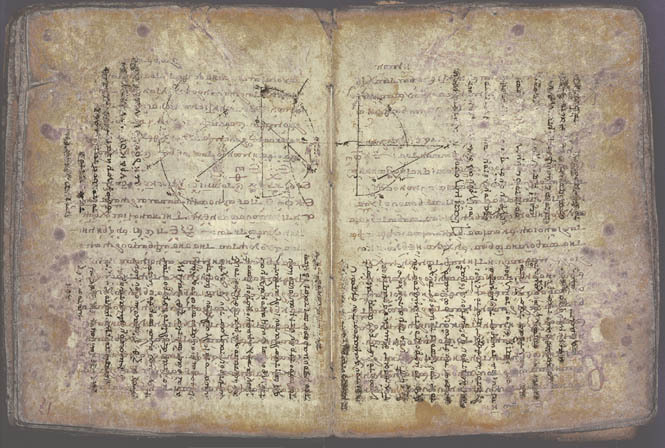 A medieval copy of Archimedes’ work called a palimpsest found in 1906. 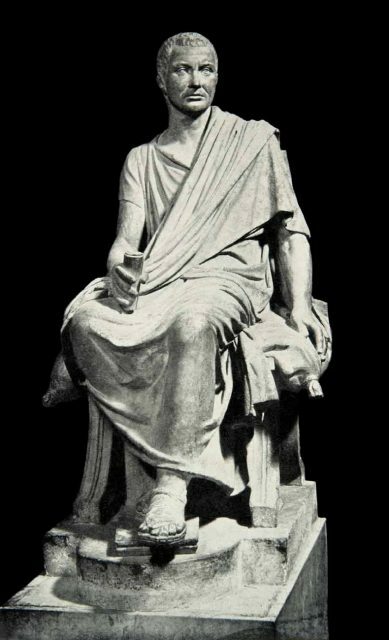 Marcus Claudius Marcellus, the Roman general that had been his opponent for so long, declared his killers murderers and personally apologized to his relatives. On his tomb was placed a sculpture featuring a sphere and cylinder of equal height and diameter, a symbol of his favorite discovery in mathematics. In 75 BCE, the famous Roman orator Cicero would claim to find it, but its location to this day remains a mystery. However, the extraordinary legacy left behind by such an incredible man can never truly be forgotten. The tales surrounding his intellect during the Siege of Syracuse exemplify the immense respect he has earned within the annals of history.